For the last 2 days, the kids just took cheese cakes for their break during mid-test. Today, I just made two quick and easy, small portion bento for the kids. Not very brilliant, I was just too lazy and unmotivated to make bento during the mid-test week. The bunnies were cut using various cutters to get a shape of bunny. The new B.O.M.B Challenge is bunny themed bento. Don't forget to participate, just read the rules and how to submit your bunny bento at Hapa Bento. Have fun this weekend to all of you!! Audrey's Bento (Top) : rice, bunny ham, minced pork meat mixed with corn and spring onion in teriyaki sauce, steamed broccoli, edamame, sweet potatoes, green bean, strawberry, baby corns, and flower shapes carrots. Andrew's Bento (Bottom) : rice, bunny ham, cheese rolled with egg, tofu fish cakes, carrots, and character shapes kamaboko. 2 bunnies bento in one post, supermom indeed. like the cute bunnies in the 1st box. nice touch with the ice cream stick for the mince meat. Those are just too super cute! I love the Shinkansen and HK hashi too! Don't know how you manage such a sunny bento every time! Have a great weekend! They don't look like speedy bentos to me!!! Unmotivated still can come out with nice bentos... you're a fab bento-er Lia! @Angeleyes : Your comment just to kind ... thanks a lot! Like the way u stuffed ice-cream stick to the meat ball, very creative! Wish you and family a nice weekend! You have a gorgeous blog, Lia. I love it! Glad to stumble across it. Your bunny bentos are sooo adorable!!! 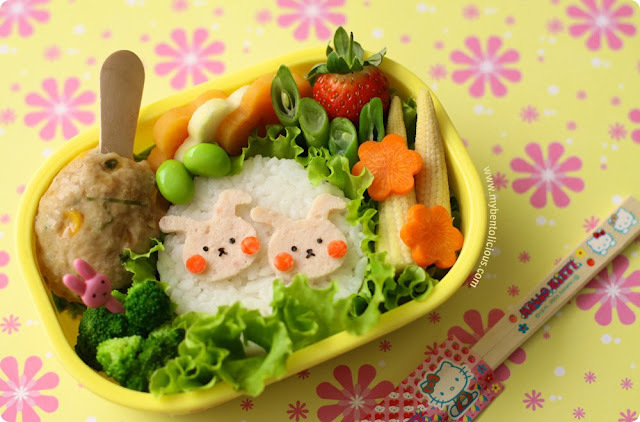 Lia, your bentos always look so pretty and delicious too! @Susan Yuen : Thanks a lot Susan for your very supportive comment! 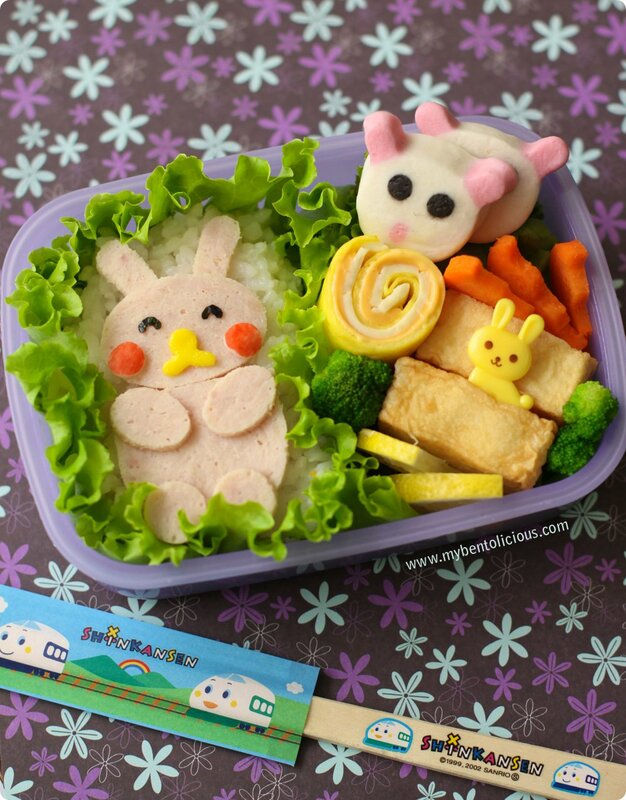 Haha, Lia--even your "unmotivated" bentos reach a level of cute refinement we all aspire to! Very fun to examine your creative bunny bento themes and variations here! both bunnies are super sweet, and both boxes are filled with healthy and colorful goodies for your kids! i love the small nose-and-mouths for the bunnies, and the kamaboko faces are awesome, i have never seen those before! @Xiao Yen Recipes : Thanks a lot! You're more than welcome to come and make bentos at my place on those lazy and unmotivated days, because these are just lovely !